This two-book companion series focuses on the rivals that met in the 1986 World Series, the Boston Red Sox and the New York Mets, including biographies of every player, coach, broadcaster, and other important figures in baseball's top organizations that year. Just about everyone knows what happened, but there are takes on it here you might not have read elsewhere. Mostly, this is the story of each of the players, coaches, managers, and broadcasters, their lives in baseball, and the way the 1986 season fit into their lives. As with many of the books published by SABR, this was a true collaborative effort. There are 74 different SABR members who contributed to making these two books on the Mets and Red Sox a reality. It took us two books to tell the story as well as we wanted. Get your copy of each book for the full story! SABR members, get these e-books for FREE! E-books: Click here to download the 1986 Mets or 1986 Red Sox e-books for FREE from the SABR Store. Available in PDF, Kindle/MOBI and EPUB formats. 1986 Mets paperback: Get a 50% discount on the 1986 Mets paperback edition from the SABR Store ($15.99 includes shipping/tax). 1986 Red Sox paperback: Get a 50% discount on the 1986 Red Sox paperback edition from the SABR Store ($15.99 includes shipping/tax). 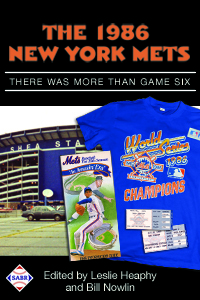 E-books: Click here to download the 1986 Mets or 1986 Red Sox e-books for $9.99 from the SABR Store. Available in PDF, Kindle/MOBI and EPUB formats. 1986 Mets paperback: Get the 1986 Mets paperback edition from the SABR Store ($30.99 includes shipping/tax). 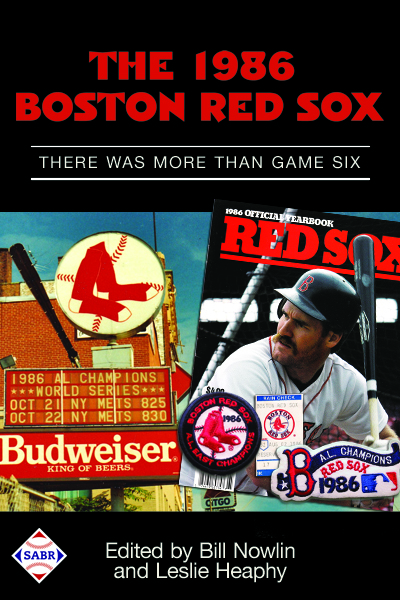 1986 Red Sox paperback: Get the 1986 Red Sox paperback edition from the SABR Store ($30.99 includes shipping/tax). For more than 40 years, SABR and its members have led the way in publishing the best baseball historical and statistical research. Our publications program is shifting to take advantage of new methods of publishing. Not only will we continue to publish new books like Can He Play? A Look At Baseball Scouts and Their Profession (released in December 2011); Opening Fenway Park in Style: The 1912 World Champion Red Sox (May 2012); Detroit Tigers 1984: What A Start! What A Finish! (December 2012); Sweet '60: The 1960 Pittsburgh Pirates (April 2013); Inventing Baseball: The 100 Greatest Games of the 19th Century (July 2013); Thar's Joy in Braveland: The 1957 Milwaukee Braves (May 2014); Detroit the Unconquerable: The 1935 Detroit Tigers (December 2014); Winning on the North Side: The 1929 Chicago Cubs (February 2015); Scandal on the South Side: The 1919 Chicago White Sox (June 2015); The Team That Time Won't Forget: The 1951 New York Giants (December 2015); and Nuclear Powered Baseball (January 2016), which showcase the best efforts of SABR's members, chapters and committees, but new technology makes it possible for us to bring out-of-print titles like Run, Rabbit, Run: The Hilarious and Mostly True Tales of Rabbit Maranville (February 2012), Great Hitting Pitchers (March 2012), Nineteenth Century Stars (August 2012); Batting (January 2013); The Fenway Project (September 2013); and '75: The Red Sox Team That Saved Baseball (April 2015) back again. This page was last updated October 31, 2017 at 4:12 pm MST.